Belina's Adventures: In The Middle of Cold Weather..... Warming It All Up! In The Middle of Cold Weather..... Warming It All Up! Vegas has always had things go over the top and this year was no exception. The Palazzo, next door to the Venetian put on it's Winter Wonderland and it was out of the ordinary. While it didn't snow this year, the casino does have a snowfall each hour, inside. That, along with more than 10,000 specially developed white poinsettia plants used to create a 16-foot-tall mother polar bear and her 6-foot-tall polar bear baby. The two weigh more than 5,000 pounds and are balanced under that falling snow on an ice float that hovers above the water. An Ice King and Queen sailed in on a Venetian gondola to unveil the exhibit. It includes some 250,000 cranberries donated by Ocean Spray poured into a water feature at the Waterfall Atrium that links to the adjoining Venetian. They created their own cranberry bog in the atrium. The Palazzo’s gardens have been filled with poinsettias and 25-foot silver-tipped pine trees. There’s also an 80-foot-long vine decorated in lights, ornaments and oversized pine cones and berries. One of the nice places to go for a walk and look see on the Strip, gets you out of the house too. Woke up this morning and had to run to the bathroom to get dressed since the house was cold and I was feeling it more than usual. I should explain that we like a cold house and never use the heater, no matter what and today I felt it. Instead of heating up the house, we resort to socks, sweaters and throws to recapture warmth; during the summer we do use the AC but keep it a reasonable (and more economical ) 70-75 degrees. If you want it sub-zero cold you can always pop over to the mall and shiver for a while..... besides, coming out of that fridge like cocoon into the triple digit heat pretty much guarantees you a cold, which I will gladly do without. I don't have to tell you it's still cold and at middle January it's not hard to understand as most places on our globe are having a tough time of it- the news are pretty amazing when you read about Florida's possible loss of their citric harvest to Seoul's sub-zero temps. But putting it in perspective, Vega's 50 degree day temperature is nothing to complain about, especially when all you need is a sweater to get by; however, night temps have been under the 40 degree mark and it does get quite nippy. Kitty is laying on my pillow whil e generous warm ray's from our early afternoon sun wash over her while she naps..... In my next life I want to come back as my kitty! Yesterday I spent the afternoon making my market rounds (4 markets, 5 hours.... Phew! ), came home to make a "Mustard Mussel Saganaki" dish to make the best use of the fresh mussels I got (and so I wouldn't freeze them at all and have them at their best!) and since my pantry is full of promise, I sit here "talking" to you and trying to sort out my menu's so I can begin planning tonight's dinner. Having gone to the Korean market and finding all sorts of seafood goodies (amazing fish heads & tails, squid & fish) and to give us some true comfort food, I've decided on a fabulous "Bouillabaisse with a side of Rouille" which will go over in a big way..... I just need to pop over to my local French Baker and pick up a couple of crusty loafs of break to use. "Bouillabaisse" as we all surely know is a Provençal fish soup, and and you must stress the importance of keeping it simple; the broth is fortified with lots of seafood shells and trimmings (available for less than a dollar a pound at your fish counter) and flavored with the typical flavors of the region: garlic, saffron, olive oil and tomatoes. How about that for a knockout dish! Heat the oil in a tall pot (I used an 8 quart stockpot) over medium heat; add the onion and leek and cook gently until softened. Stir in the garlic and cook for a minute until fragrant, then add the tomatoes, water, herbs, saffron, salt and fish bones. Bring to a simmer, then reduce heat so that the broth bubbles slowly without boiling. Cook 30 minutes, then strain the broth into a large bowl or another pot and discard the solids. Pour the broth back into the stockpot and bring to a boil. Add the shrimp and cook until they turn pink, a minute or two. 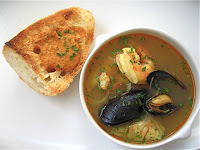 Add the rest of the fish and shellfish, cover and simmer until the mussels or clams open. Taste the soup and add more salt and freshly ground pepper if needed. Puree everything except for the olive oil in a food processor until smooth. Slowly add the olive oil while processing to form a paste. Toast good bread and spread Rouille paste on it and serve. Mustard Mussel Saganaki.- Mussels are beloved in Greece since they are plentiful and this is a lovely way to use them. 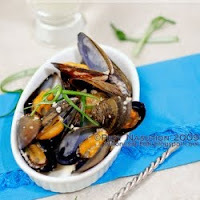 The mustard sauce is perfect for this and Mussels are economical too! Place your cleaned mussels in a pot with some olive oil and a splash of wine. Crank the heat to high, cover and simmer for 3 minutes. The mussels should be just opened. Discard any that have not opened. Pick out the the mussel meat and reserve with the broth. Add the olive oil to a skillet and add the scallions, grated tomato, mussel broth, chili pepper, red and green peppers, a dash of salt and simmer for 10 minutes for the vegetables to soften and the sauce to thicken. Add the mussels, oregano and mustard and continue simmering the the mixture for approximately three minutes, do not allow the mussels to harden. Add the crumbled feta, a splash of heavy cream and garnish with parsley and chili flakes. Potatoes with Feta Gratin.- I got a huge brick of Yugoslavian Feta (strong flavored and so good! ), that considering side dishes to fill up my guys, it seemed a natural "twist" to an old standby which will now be THE way to make it, much better...... A hearty casserole with a Bechamel sauce base which is flavored with the tart Feta taste. Pre-heat oven to 400 degrees. Bring a pot of water to boil. Add salt. Cook potatoes until tender, about 10-15 min. Drain. In a saucepan, put butter and some olive oil over med-high heat, add your onions, garlic, bay leaf, half your rosemary sprig and cook for a couple of minutes until softened. Add the flour and stir for a couple of minutes to insure the flour is cooked. Add the milk and stir until the roux has thickened, you'll see it soon. Add garlic and 1 cup crumbled feta. Stir gently and make sure it's well blended, add salt and pepper and taste. Grease a baking dish and put some of the thick sauce in the dish. Put potato slices, coverng the area evenly and overlapping each other. Keep making rows until it's all well covered. Spread the rest of the sauce over the potatoes, put the last of the feta on top along with the olives and some of the rosemary. Add salt and black pepper bake in the oven for 30-35 minutes or until golden brown. NOTE: You can also add other ingredients to this, like: tomatoes, sausage, chicken, veggies, white wine, etc. I'm working on more cheese based dishes to post and take advantage of the variety of cheeses I got from the International Marketplace. This is an exceptional market that stocks items from all over the world, specializing in Oriental, along with gifts, pottery, dishes and cooking utensils, but also has a large selection of dairy items so you can find butter, yogurt and cheese to suit everyone's taste as well as fresh fish and seafood, vegetables and spices that will get you in the mood for just about anything. When Rene was small, the candy selection here was a big temptation and since we used to live 2 blocks away was a weekly stop. They also have a section dedicated to Oriental & European style fountains (how about this for a contrast?) so you can see Art-deco elves and fairies among those good luck cat figures to natural bamboo squirting water. I love the contrasts!